It’s Friday! Do you want this bottle of Herbal Hydrating Serum? Simply comment on this blog to enter the beauty giveaway! One winner will be picked on Monday. * This contest has ended. Check in with this blog every Friday for a new Fan Friday Giveaway! In case you’ve never tried it before, it’s a really unique oil-free gel formula for extra hydration. It can be used alone as a light hydrator for all skin types (including oily) or layered over moisturizer for added moisture. *Contest is open to residents of the U.S. and Canada and will run from 6/7/13 – 6/9/13. Winner will be announced on Monday, June 9, 2013 and will be contacted via email. This sounds like the perfect alternative for my moisturizer this summer! I love this product!!! It really saved my dry skin during my pregnancy. oo I haven’t tried this yet! Want to try this product. I hope I have good luck! I want free moisture, plz! I have been wanting to try this forever! What a great opportunity! Love these products – this serum looks wonderful! I have a sample of this at home that i’m literally hording….I tooooootally want this! I am so in love with the MB line! I would buy every single product if I could! I have had cystic acne for about 10 years…..I heard about the MB line about 4 months ago and figured I have nothing to lose, so I gave it a shot…..I have been able to stop taking all medications and my face has never looked better! THANK YOU, MB!!!! I love my MB products and this looks like a great item for summer! I’m new to Mario Badescu products, I’m maybe 2 weeks in. In 2 short weeks I have noticed a change in my skin that has never happened before. I’m in love with these products and looking forward to trying all of them!! thanks MB for such great products!! I tend to have very dry skin and this would be a wonderful addition to my moisturizer. I love the Mario Badescu skin care and everything I have tried has worked wonders for my skin! Not only is your product line amazing, but your customer service has gone above and beyond my expectations! Thank you for this opportunity to win! Love all my MB products! I would love to try this one! Ohhh…. Looks like a right product to me. My friend use this one all the time. She is very picky one when it comes to skin care. But she is absolutely loves this one. I love all my MB products and would love a chance to try this. I’m sure it will become another product I can’t live without!!! Thanks!!! I have used some of your other products and would love to try this one. This sounds like an awesome product. My skin needs as much moisture as it can get :-). This would be the perfect addition to my skincare routine. Thanks! The last year or so my skin seems so dry. Would love to try this out. Once I hit 30 my skin is desperate for all the moisture I can give it. Love to try it and add it to my already vast MB hoard! I haven’t tried this product yet, but I would love to! It sounds like the perfect moisturizer for me… and extra helpful spending the summer living in the desert. I would love to win this! Mario badescu is amazing! Yay it’s Friday! Love the Friday Give-a-ways! Love Mario Badescu products!!!! Would love to try this! Mario Badescu products have been part of my everyday skin care, I am susceptible to facial skin irritations, itching and rashes but ever since I used the glycolic facial wash and moisturizer my skin is glowing,supple and free from irritations. I have not tried this yet and I would love to! MB products are amazing! Yay… me want some herbal serummm!!!!! I have not tried this particular product, but it sounds good for those particularly stubborn areas of my combination skin. I ABSOLUTELY LOVE the Herbal Hydrating Serum. I got married August of last year. I few weeks before my wedding I noticed that my face looked bumpy and it was peeling. My skin has a tendency to do that but it was peeling more than usual. (perfect timing) My skin didn’t look its best and the products that I was using just wasn’t working. I was in a state of panic. The last thing I wanted was to have terrible skin, especially on my wedding day! I tried everything from facial masks to using an home mircodermabrasion kit. Nothing seemed to help. I ran to the beauty store, Ulta (at this point hoping for a miracle). A wonderful lady behind a counter immediate suggested the herbal hydrating serum from Mario Badescu, after I explained to her my situation. She said that the serum is a product that she uses and she sees great results on herself. She insisted that I try it. I decided to give it a go! That was probably the best decision I made for my skin! I saw IMMEDIATE results and my skin never looked smoother. Not only did my skin look flawless on my wedding day, it still looks better than ever today, all thanks to the Herbal Hydrating Serum. I never go anywhere without it. I apply it in the morning before I start my day and at night before bed. It also works as a great base coat before I apply on my makeup. And all it take is just a small amount! simply put, it is the BEST! I am a lifelong fan of the Hydrating Serum! I have such dry and aging skin that this would be so great to win. This is the best serum. I would love to win it! I would love to try this product – love all of the MB products I do use! This is a perfect solution for my rollercoaster skin. Thank you so much for this opportunity! Recently switched to mario badescu skincare products I love your washes and toners and I’m excited to try more of your products hope I win this! I love your products! I can’t wait to also love this! Sounds like a great product. Would love to win this. I’ve recently changed my whole skincare routine over to MB products and my skin has never looked better!! I am now trying to get my mom to switch and with her super dry skin, I think this would be the perfect product! Been eyeing it for her for the past few weeks! I’m in love with Mario Badescu products! My skin has been illuminating ever since I found what works for me and believe me I tried it all. I am constantly sharing what I call “the good news!” MARIO! His product line is phenomenal and I feel blessed just to have found it. I would love to try this serum and add it to my on going collection. It’s by far the best skin care line with the most interactive websites and blogs out there. Totally IN LOVE! My skin is so dehydrated since moving to Chicago! Would love to win this!!! Mario Badescu products have changed my skin for the better. I would love to win! I just bought the seaweed soap and drying lotion last week when I went to the States. I love them so much! This product also looks equally amazing. Love all the products I’ve tried. Been thinking about giving this one a whirl. I live for Mario Badescu. I found a trick with the drying lotion. I put it all over my nose at night, in the morning all the blackheads are gone!!! The enzyme gel cleanser is the best!! I love it when I buy at ulta and get little sample products to try. I want to try this to…pick me, pick, me! I am running out of serum and perhaps this might make a good replacement for my sensitive skin? This sounds amazing, especially after spending a day in the sun at the pool! Use this everyday it’s amazing! In need of a new bottle though, I’m almost out!! I have been using the strawberry face scrub, calma mask and the healing cream, the Herbal Hydrating Serum would complete my beauty routine. Thank You for the opportunity. My skin could use this. This sounds like a great hydration product even for people with combination skin. I’d love the chance to test it out on my face and share the secret with my friends who might need something just like this as part of their regime too! I’ve been searching for the right Hydrating Serum for a long time. This product might be it! And finally my search would be over. My skin gets oily in the summer and I still haven’t found the best moisturizer to help it so I’d really like to give this oil-free gel formula a try. This is exactly what I need for the summer. I hope I have a chance. Herbal Hydrating Serum really saved my skin after my dermatologist put me on very strong topical treatments to treat my adult acne. After a few days into using the topical treatments my skin was so dried out by the retinol-A & sulfur combination but he told me to still go with the treatment. So I went to my favorite counter at Lord and Taylor’s on 5th Ave in NYC and they suggested I try this product… I was very hopeful and that night I prayed I would be restored and sure enough my skin was not flaking in the morning and good as new! After the next application I was back to normal! This is by far the best hydrating serum I have ever used and I am so happy and really a true fanatic of Mario Badescu because they have something for every skin issue that can occur! This would be the perfect moisturizer for the winter! My skin is really oily, but once in a while the harsh cold of Canadian winters can dry it out. This oil-free formula would be lovely to use without causing breakouts! Oily skin needs hydration love too. Oooh, oooh!!! Pick me, pick me!! I would LOVE to try this! I haven’t tried this, but I’m working my way through all your stuff! Great products! This is just what I need! My skin has been so dry and problematic lately! I would love to win this product simply because your sample products helped my face not have broken capillaries and I only used them for a week and I can’t wait to order more of your products in the future, I also let my mom use some of the samples I got and they worked by getting rid of her age spots. So she is a fan of the product too, and we both are thankful for your products being the most amazing products we ever used. I so want this so bad. Time to get skin ready for summer. I have extremely dry skin; nothing I tried kept it hydrated. 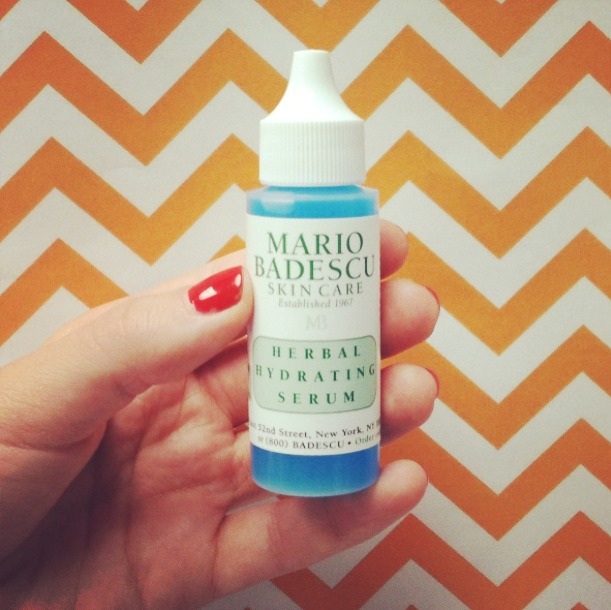 I started using Mario Badescu Herbal Hydrating Serum a few months ago and it saved my skin! Now when I wake up my face is soft and silky. This product is amazing and I recommended it to everyone. Just discovered MB products! Can’t believe it took me so long! This serum looks great! Mario badescu products are the best !!!! Would love to win and try a bottle of Herbal Hydrating Serum. Keeping my fingers crossed! Would love to try your hydrating serum as it sounds wonderfully refreshing! I would love to try out this product! I haven’t tried this yet, I hope I get a chance to! Want to make my next purchase the “Whitening Mask” and this serum would be great as my next step along with moisturizer. So hope to win this time as I love all of the products that I have purchased for my skin care regimen. Summer is drying out my skin! I need help immediately 🙂 Can’t wait to try this product! Ive been wanting to try this and currently yahoo is recommending as an alternative to a creamy lotion this summer! Just ordered my first batch of mb products and they get here today! woooooo!!!! This product is perfect for my oily skin, especially with the summer heat and humidity already in full force! Keeps my face hydrated without adding any shine, keeps oil at bay throughout the day, and helps prevent breakouts. The Herbal Hydrating Serum really is the perfect summer product! The sales rep talked to me about this product and gave me a sample. Loved it. Its a facial in a bottle and its light so a little goes a long way. My face felt fabulous all day. What a difference Mario products have made! My forehead wrinkles are almost gone thanks to the cellulite drops and seaweed night cream. Also gone are the small face pimples due to hormonal changes.Didn’t need to use acne products for them, my daily mario products did the job and balanced out my combo skin. The herbal hydrating serum is the best product for me to use as a daily moisturizer in the humid Florida weather. I love this serum! It’s like the ‘Goldilocks’ of hydration…not too little, not too much, but just right! This serum would give me the perfect boost of hydration right now. The weather has been so crazy lately and it definitely plays out on my skin! I have irritatingly dry skin and I’ve been told bu many people that this is the perfect addition to my MB collection. I would love to try this! I absolutely love Mario Badescu products.I use the glycolic toners & the silver powder. Would love to add this to my skincare routine! I have never tried your products, but I would like to see how they work on over 50 skin! Thanks for the chance! I live in the desert and have to deal with dry skin every day. I like that it can be layered over moisturizer. The more moisture I have, the better. I’ve already commented on this before. But I was in ulta this past weekend grabbing my enzyme cleansing gel and a lady was curious about Mario. I couldn’t help but chime in and offer some assistance! I told her I was going to share the good news with her and she ended up purchasing three different products. If you are considering using Mario, don’t hesitate it’s phenomenal! #teammario! Thanks for helping her out Ashley! We’re so glad to see that the products have worked so well for you! I’ve been using MB for a year now, I love it. I haven’t tried a sample of this yet and would love to. I have read the features of the product. I am so happy to let you know that, I must try it. Wow I really need this. I hope I win! I’ll forward this post to him. Pretty sure he’s going to have a very good read. Ooh this sounds refreshing can’t wait to try it!